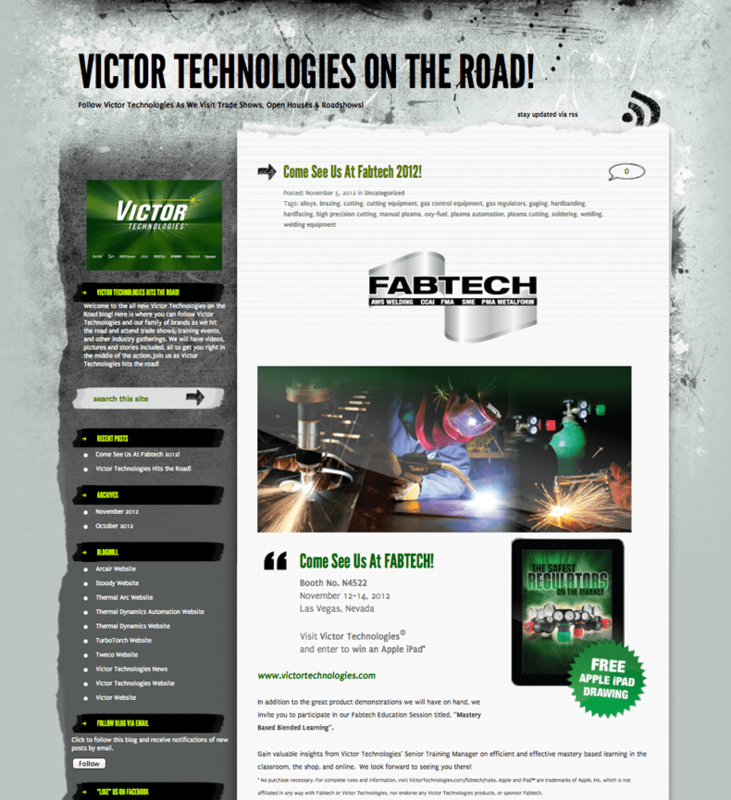 Learn More About the Latest Solutions from Victor Technologies! Arcair-Matic® N7500 Travel System Packages Arcair®, the industry leader in air carbon-arc products, joined together with leading travel system manufactures to bring to the market the best automated metal removal system — providing superior performance, flexibility, versatility, and safety for your metal removal applications. 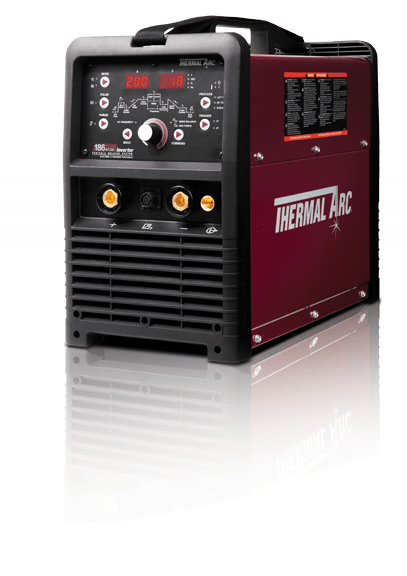 The 186 AC/DC is a fully featured, professional performance machine that has been made easy to use with integrated controls and a simple to use set up chart. machine has the power you need. 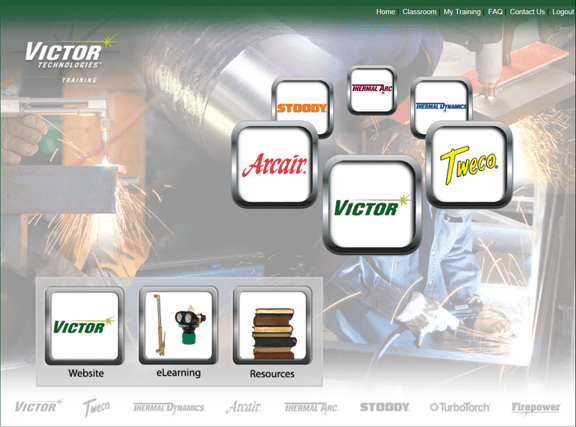 The Victor Thermal Dynamics 1Torch utilizes revolutionary technology that allows these torches to work with almost any plasma cutting system. 1Torch allows end-users to standardize torches and consumables on a variety of manufacturers’ systems, thus reducing inventory requirements and corresponding expenses associated with operating multiple systems. 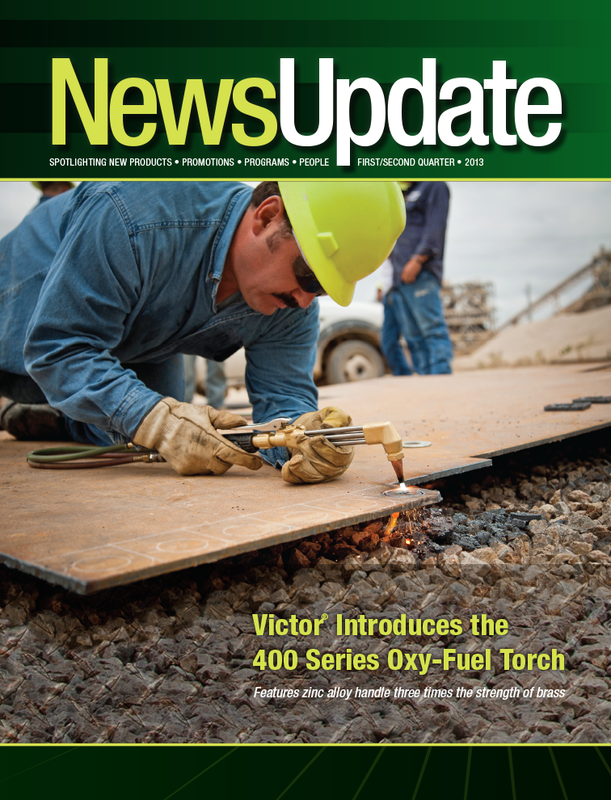 One torch for virtually any plasma cutting system! 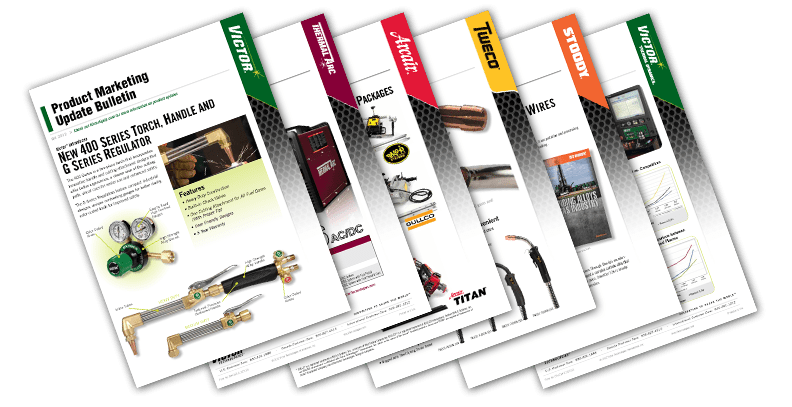 Tweco introduces its new Velocity MIG consumables platform, which is integrated into the new Tweco Fusion series of light-duty MIG guns.The non-threaded, “drop-in” style Velocity contact tip eliminates the need to use vice-grips, welpers or other tools to remove the tip, even if the wire burns back and fuses inside the tip. The Velocity consumables design integrates the gas diffuser into theconductor tube. This creates an improved all-copper conductor path thatprovides better electrical conductivity and transfers heat more efficiently away from the tip. As a result, the arc becomes more stable and predictable. 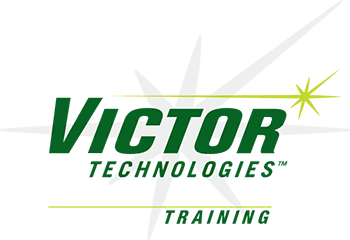 To learn more about the full range of innovative, industry leading educational opportunities that the Victor Training Team offers, visit the Victor Technologies Training Center. OVER 25 YEARS IN THE MAKING! 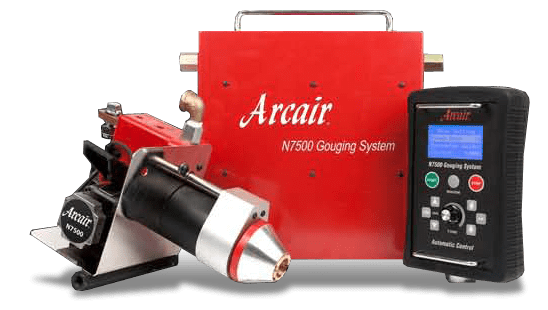 Arcair®, the industry leader in air carbon-arc products, introduces the Arcair-Matic® N7500, a next generation automatic gouging system that provides superior performance, flexibility, versatility, and safety. 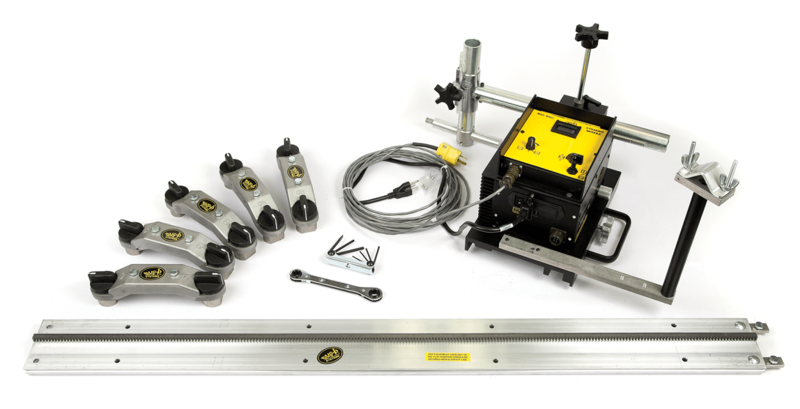 The Arcair-Matic® N7500 gouging system delivers high productivity for any metal fabrication operation where gouging and welding represents a large portion of the work schedule. 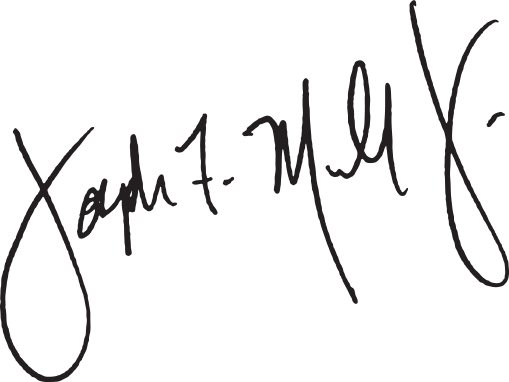 The system can be utilized on almost all metals. 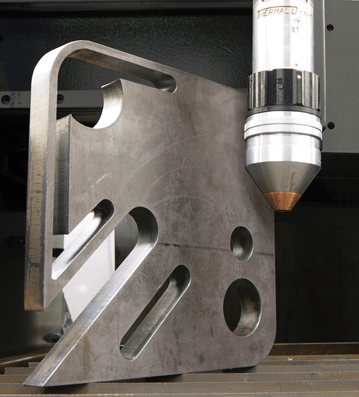 A typical automated gouge requires 10 times less grinding and improves your overall metal removal productivity. 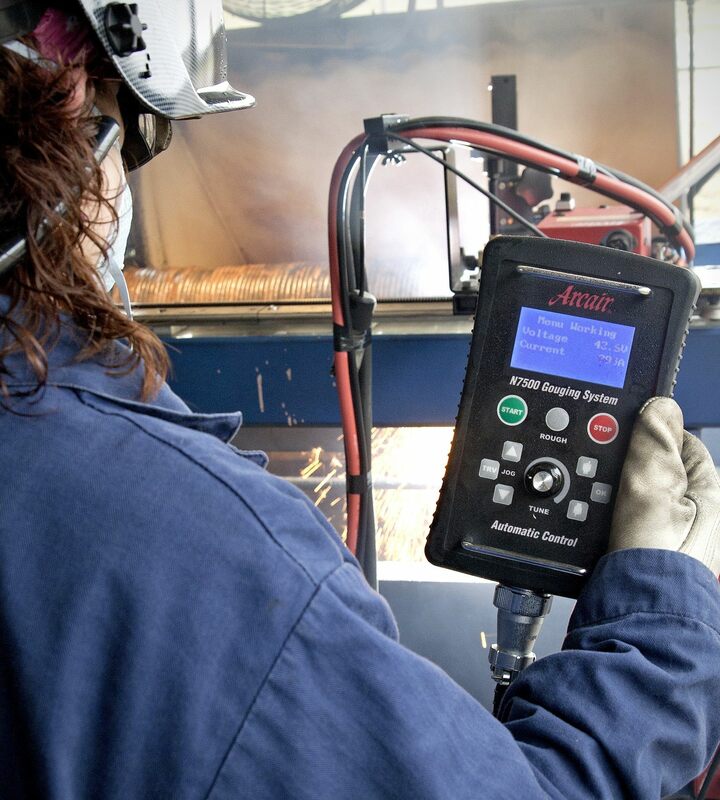 The Arcair-Matic N7500 gouging system will produce excellent U-groove edge preparation and back-gouging for both plate and pipe, and with less edge distortion than flame cutting. It can J-groove a 1″ (25.4 mm) thick plate about 50% faster than an automatic flame torch can bevel. And since a J-groove requires a lot less fill metal than a bevel joint, welding is done at 1.5 times the speed. Arcair-Matic N7500 features a digital pendant and other enhancements for greater control, accuracy and safety. 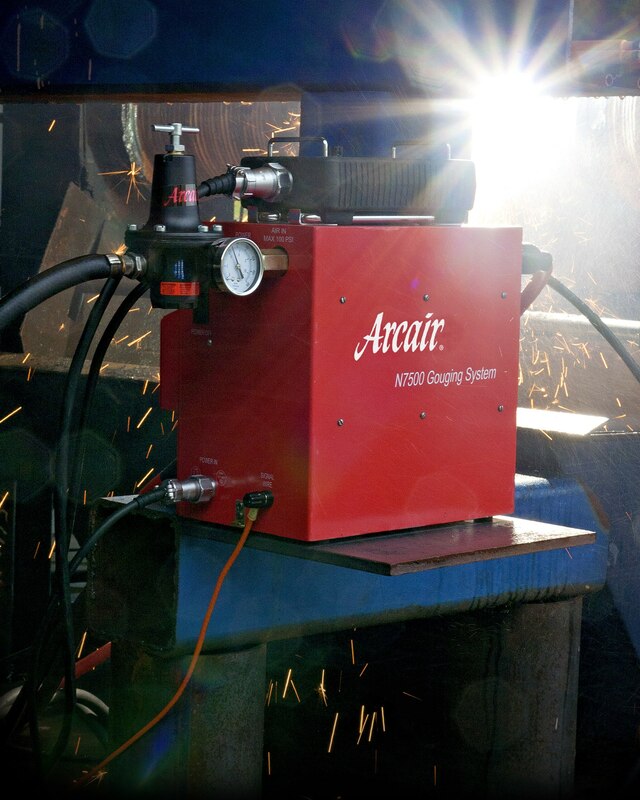 ST. LOUIS, July 26, 2012 – Arcair®, an industry leader in air carbon-arc products, has introduced the Arcair-Matic® N7500, an automatic gouging system that offers five times greater productivity and 10 times faster clean-up compared to manual carbon arc gouging. It can gouge with carbons up to 3/4” in diameter at 1600 amps at 100% duty cycle and gouge with an accuracy of 0.025”. Slag removes easily and the bottom of the gouge exhibits minimal carbon deposits. A digital pendant that improves consistency through a pre-set parameter menu (view video) based on carbon size and gouge depth. An extended front end that provides operators with a better view of the seam, making it easier for them to keep the torch on track. A rough machining mode that compensates for out-of-round rolls or pitted areas by enabling the operator to stall the electrode feed. Safer operation; it uses the power source’s remote contactor switch and keeps the system electrically cold until the start button is pressed. Also enhancing safety are “no current” detect and low voltage functions that shut down the system when these conditions are present. The Arcair-Matic N7500 pendant puts all controls in the operator’s hand, while the LED display clearly shows parameter values. Use the N7500 to gouge seams for full penetration welds, repair worn steel rolls, remove damaged cladding material from inside paper mill digesters or otherwise make long, repetitive gouges on plate or pipe. The N7500 finds applications in the pipe, pressure vessel, wind tower, ship, rail, bridge, girder, steel, mining and aggregates industries. 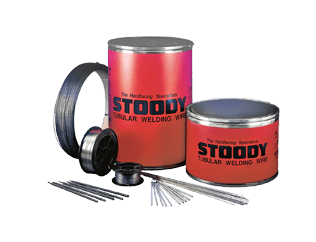 It can be used on almost all metals, including stainless steel, carbon, manganese and chrome-moly steels. The N7500 gouging system produces excellent U-groove edge preparation with less edge distortion than flame cutting. It can bevel a 1” (25.4mm) J-groove about 50% faster than an automatic flame torch, and since a J-groove requires less fill metal than a conventional V bevel, welding is completed about 150% faster. A unique “travel delay” function assures excellent groove geometry at the very beginning of the groove. This function avoids a sloped groove at the beginning of the gouge and can eliminate the need for a starting pad. The remote pendant puts complete control of the gouging operation where it needs to be: in the operator’s hands. The operator has full control to manage the gouging parameters. The set-up selection guide is viewed on a LED display instead of analog gauges. The pendant can track arc-on time to help schedule routine maintenance, as well as monitor and manage cost of the gouging project. With unsurpassed versatility, the system’s synergic mode ensures conformity to pre-determined, pre-selected groove depth and width specifications. A single electrode contact shoe assembly accepts the entire range of Arcair gouging electrodes, from 5/16” (7.9 mm) through 3/4” (19.1 mm). The Arcair N7500 can be used with CC and CV power supplies. It utilizes the contactor in the welding power supply unit, thereby eliminating the need for the external contactor unit. One unit can service both the domestic (110 VAC) and the foreign market (220 VAC). 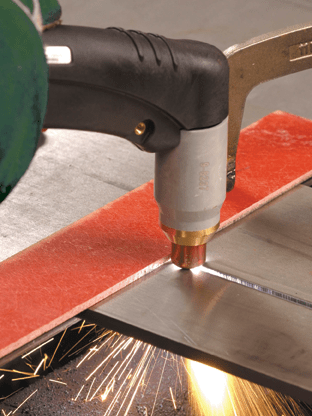 Arcair is a leader in air carbon-arc gouging, exothermic cutting and underwater cutting and welding products, providing a complete line for a wide-range of industry uses. Products include manual and automated gouging equipment, torches, accessories and carbon electrodes.